Teej Festivals; One of the major festivals in Jaipur. Teej is one of the popular and widely celebrated festivals of Rajasthan. 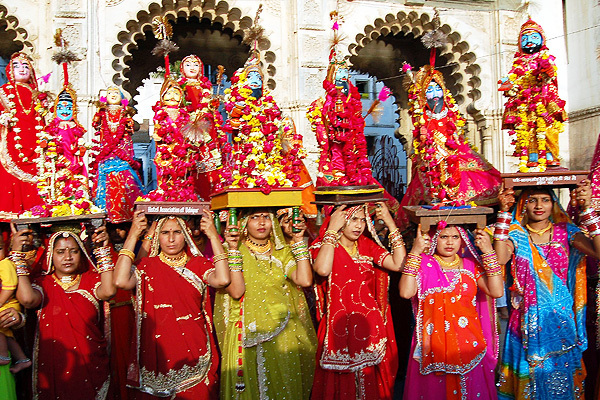 Teej Festival is the most popular among the women population of Rajasthan. This festival is celebrated every year during the monsoon season between July to August. The festival has a great religious significance. The festival is dedicated to Lord Shiva and his consort Parvati. The colourful and vibrant celebration of this festival calls on scores of tourists to this place from across the globe. 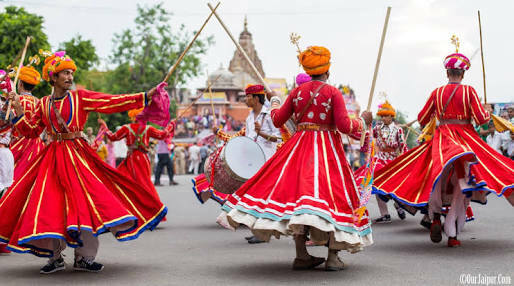 Although this festival is celebrated across Rajasthan state, but Jaipur is the centre stage because of its lively and fanfare celebrations. Teej festival is primarily meant for the married women and girls. During this festival married women and girls worship the goddess Parvati in order to gain virtue, devotion and fertility. The festival is celebrated to commemorate the reunion of Lord Shiva and Goddess Parvati after years of penance. There are three types of Teej festivals which are celebrated with great pomp and enthusiasm. The young girls also actively take part in this festival. Married women carry out the various rituals and pray to Goddess Parvati for well being of their husband. They also pray for a blissful married life. The festival holds a lot of importance for the people of Jaipur as, during the festival, the pick city gets enveloped in green colour. Women in this part of the world also dress up in colours that signify freshness and richness. Their accessories mainly include coloured bangles and jewellery. On this day parents of married women send Sinjara to their daughters, which is a gift pack that includes bindi, vermilion, Mehandi or henna, bangles, ghevar (a special Rajasthani sweet) and lahariya (a multi-coloured sari) as a symbol of their overtures. After accepting those gifts sent by her parents, the married ladies adorn themselves with henna, jewels, wear the lahariya sari and take delight in the celebrations of this auspicious festival of Teej. 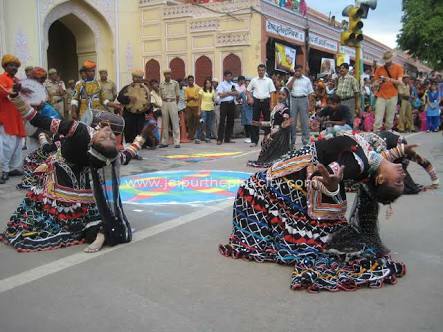 Fairs are conducted on this festival; processions are taken out from Tripolia gate of this Pink City Jaipur. Passing through various markets, it ends at Chaugan Stadium. 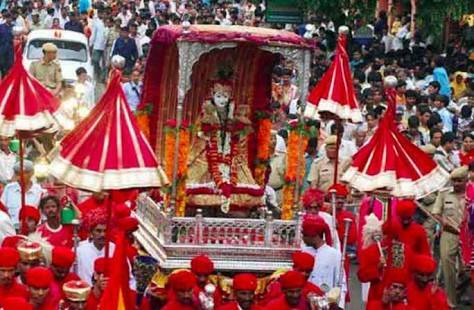 The idol of Goddess Teej (incarnation of Goddess Parvati) is decorated by the royal families of Jaipur, for the fair. The convoy of beautified elephants, horses and camels are made to walk before Goddess Teej’s palanquin made of gold and silver. Various folk dances are performed to the tunes of folk songs during this rally. Decorating the Teej Mata temple is also an integral part of the festival. The idol of Teej Mata is adorned with and traditional jewelry and beautifully embroidered clothes. On visiting the festival, you will also get to hear devotional songs sing by the ladies. These songs are dedicated to Goddess Parvati. The place boasts a different look during the festival as the lawns and the gardens are wonderfully decorated. They are decorated with a number of swings. These swings decorated with strings of marigold and spring flowers. The festival also features a procession with the idol of Teej Mata. The procession terminates at Kanak Vrindavan.